Reach out to the right customers at the right time with our extensive range of rectangular flag banners. You can use our rectangular flag banners for indoor or outdoor advertising. Our portable and durable rectangular flying banners are sought after by exhibitors at different trade shows. 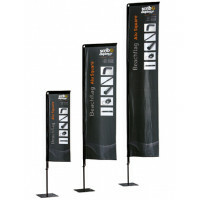 These cost-effective, lightweight and weather resistant rectangular flag banners are custom-printed and mounted on heavy duty carbon fibre poles with a choice of mounting accessories. The rectangular flag banners can be custom-printed in 3 sizes and can be used with poles mounted on wheel bases, ground spikes, cross bases or water bags. The accessories for the rectangular flag banners can be stored in black canvas bags provided for the purpose. 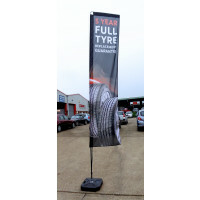 Browse through our range of rectangular flag banners to locate the outdoor display equipment of your choice.